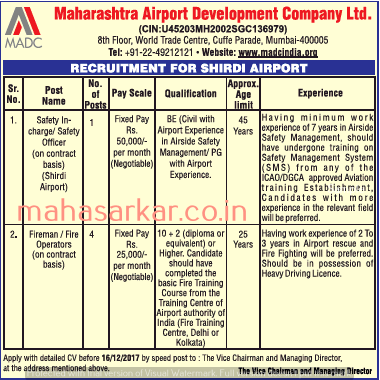 MADC Shirdi Airport (Maharashtra Airport Development Company Limited), Shirdi Airport Published Job Notification for 05 Safety Incharge & Fire Operator Posts. Candidates who wish to apply must look at MADC Shirdi Airport Recruitment 2017. Eligible candidates can apply offline before 16-12-2017. Education Qualification: BE/12th and More. For Post wise Education Details follow the detailed advertisement. Age Limit: For Safety Incharge/Safety Officer post Minimum 45 years and for Fireman/Fire Operator posts minimum 25 years. Interested & Eligible candidates can send their application along with all the necessary documents and testimonials to The Vice Chairman and managing Director, Maharashtra Airport Development Company Limited,8th Floor, World Trade Centre, Cuffe Parade, Mumbai – 400 005, Maharashtra. Starting Date, Last Date to Apply Offline at Maharashtra Airport Development Company Limited which candidates should be remember as follows. Start Date to Apply Offline: 06-12-2017. Last Date to Apply Offline: 16-12-2017. Gondia GK Current Affairs 2019 Gondia History | Gondia Geography | Gondia Science | Gondia Polity | Gondia Economy | Gondia Law etc.